A monthly series corralling my favorite reads, products and finds from April. 1. 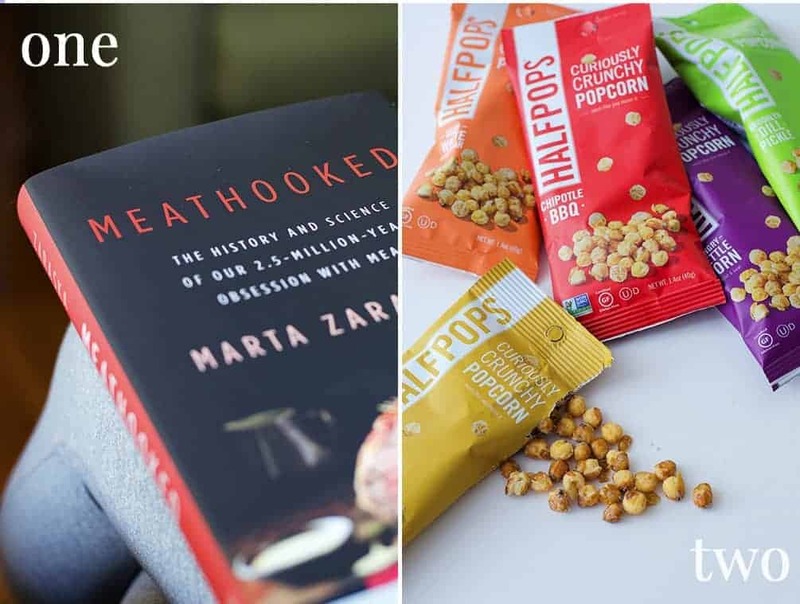 Meathooked: If you loved the Omnivore’s Dilemma, then you must read Meathooked, the history and science behind our 2.5 million-year old obsession with meat. It’s a witty, well-written tour through the “meat paradox“- our willingness to eat meat even with the known dangers that it poses to both our health and the environment. Whatever’s on your plate, you will enjoy this book. Much like one of my favorite books on the subject, it’s not a pushy-prose into becoming a vegetarian. Instead, Meathooked is more of a philosophical and scientific look on how animals play a role in our food environment and what that means for the foreseeable future. It’s one of the best books I’ve read in a while, and I highly recommend it. 2. HalfPops: I’ve been on a popcorn kick lately, making a batch of my coconut-oil popcorn every Sunday night for Game of Thrones viewing. It’s become one of my favorite rituals, and a really fun way to wind down the weekend. So, when I found these halfpop bags of popcorn, I was immediately intrigued by the idea. If you like crunchy kernels of popcorn, this snack is fantastic. So far, the sea salt and truffle flavors are my favorite (obviously), but the dill pickle version, BL’s favorite, is quickly growing on me. 3. Sponge Cloths: I stumbled upon these Orling & Wu sponge cloths in Vancouver a few weekend ago and wish I had bought more when I had the chance. 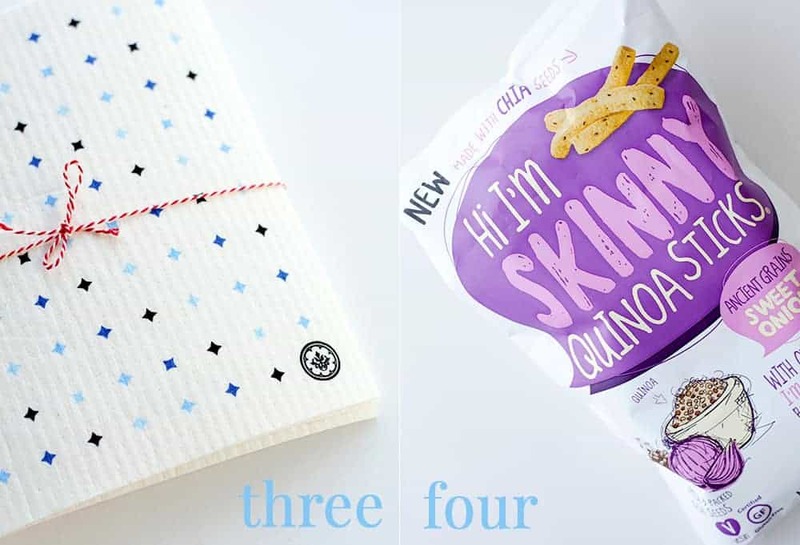 I’m as obsessed with this product as I am the concept: antibacterial and biodegradable cloths, each one with the same capacity of 17 rolls of paper towels. They are fantastic; clean as you normally would, then pop into the dishwasher for a quick rinse (or rinse out in the sink). Once it’s dry, it’s ready to go again. 4. Quinoa Sticks: On the same trip, BL picked up these quinoa sticks for our ride from Seattle to Vancouver. Even though I hate the Skinny name, I can’t deny that these sticks are amazing. Almost like a cross between sun-chips and my favorite snack of all time, Hawaiian Maui Onion Chips. I was able to find them again once we came back home, and they’ve been a weekly addition to my grocery cart ever since. 5. Perfectly Crisp Fries: My favorite summer meal includes a giant vegetable burger and extra crispy fries. 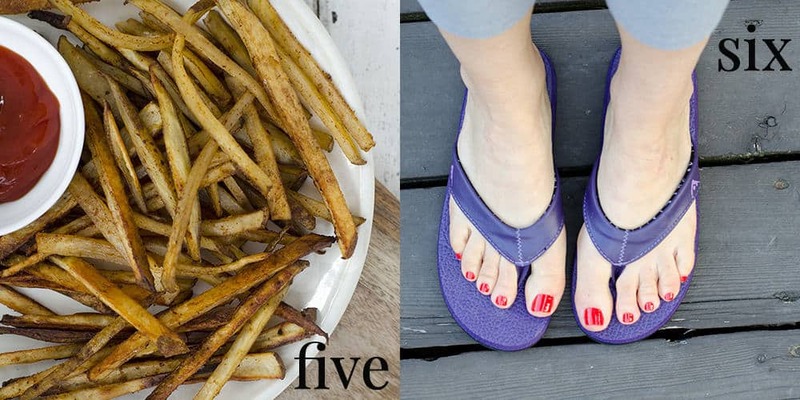 Ironically, I almost never eat french fries during the Fall and Winter months, but come summer, I crave them. So, I’ve perfected my oven-baked recipe that products crisp taters without the need for a deep-frier. Here’s the secret: thinly sliced potatoes baked in a single layer and tossed with salt, pepper and a bit of chili powder. 6. Aurorae Flip-Flops: Now that I work from home, my footwear is almost non existent. I’ve traded in my high-heels for flip flops and my toes couldn’t be happier. These yoga-mat flip flops and are so cushiony, I feel like I’m walking on air. The vegan leather strap is also super thick and soft, a nice alternative from the hard plastic that’s usually found on flip-flops. Since I loved these so much, I went back to the brand to pick up a racerback tank. If you’ve ever worn modal fabrics before, then you can imagine how soft this tank is. Honestly, I originally bought this for yoga class, but have worn it almost every day since receiving. It’s so silky and comfortable, and I love that all of their tanks are made eco-friendly, with a carbon-neutral process. Check them out! 7. Pure and Beautiful Vegan Cooking: My blogging friend Katie of Produce on Parade just published her new cookbook, Pure and Beautiful Vegan Cooking, and friends- it’s all that and more. 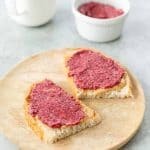 I’ve loved this blog since the moment I found it, gorgeous photos, delicious recipes and heart-warming stories. 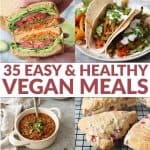 If you’re into yummy, fuss-free vegan food, then this is the cookbook for you! 8. Boundary: Of all the things I miss most about California, the restaurant scene might be it. While there are no-doubt some great restaurants in St. Louis, they also don’t cater to non-meat eaters in the way that we are used to. Those that do are usually a bit more casual, and not a place I’d turn to for date-night. 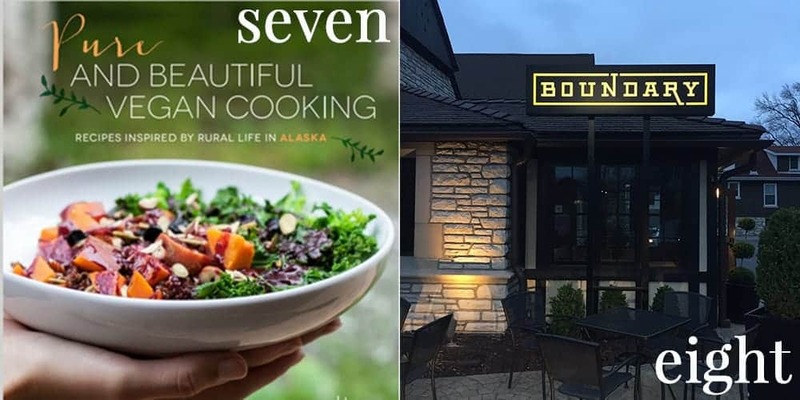 I found Boundary (and Basso) restaurants a few months ago when out with friends, and it’s been BL and I’s go-to place ever since. I love the sultry bar in front to grab cocktails before dinner and their brussels sprout toast might be the best thing I’ve eaten since moving to the mid-west. 9. Fresh Thyme Farmer’s Market: Ok, so there are two things I miss most about California: the restaurant scene and the grocery scene. The Sacramento Co-Op was hands-down one of my favorite places to shop, especially because of their extensive bulk-foods selection. I am a huge bulk fan. Considering how much recipe testing I do in a week, I hate buying large packages of items that I only need a 1/4 cup of. Of all the grocery stores in St. Louis, Fresh Thyme is quickly becoming my favorite. They have 300+ bulk goods and it’s the perfect place to grab a handful of things. Thankfully, they also stock some of my favorite brands like Dr. Praegers, Sweet Earth and Siggis. 10. 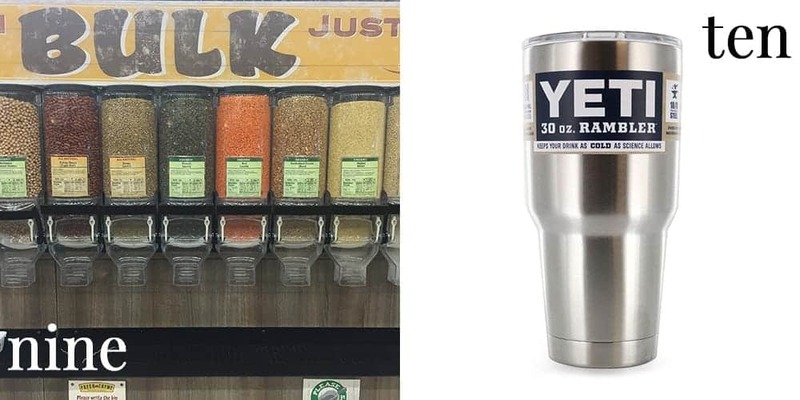 Yeti Tumbler: Have you seen these Yeti cups yet? I’d never heard of these until I visited my sister last week and now, I think it’s all I want to drink out of. They are ridiculously pricey, but something I can easily justify when I realize that I’m able to have ice-cold water with me at all times. I swear, my water intake has doubled over the past week, just because of these stainless steel cups. (My trick? Get them at Bed, Bath and Beyond with your 20% off coupon.) Besides holding ice-cold water, they also keep coffee piping hot for hours. I made a cup yesterday morning then got lost in emails, when I finally remembered my beverage, it was waiting for me, just as hot as when I first made it. What items are you loving this month? Awww, Alex you are so kind! Thank you for the shout-out! I am so happy you are enjoying the cookbook 😀 Oh man, I am totally getting some of those sponge clothes too! Todd laments the fact that I refuse to have paper towels in our house, haha.